Adjustable clubs are the latest rage and I believe TaylorMade was the first to do it. 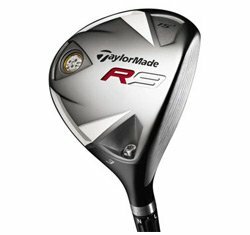 This TaylorMade R9 has an adjustable hosel that allows you to change the lie and loft angle to eight different settings. This is TaylorMade's FCT (Flight Control Technology) which will give you up to 36 yards of variance. What's more is TaylorMade had done a great job of hiding the adjustable hosel. The club looks pretty traditional, but don't be fooled. This is a modern wood with the latest and greatest technology. In addition to the adjustable hosel, the compact steel head has a pull face construction that reduces welding lines. The cast walls are a tiny 0.6 millimeter allowing for all the weight to be moved to the rear sole and giving this little puppy a huge MOI and a very solid feel. I really like the way this club sits flat on the ground, and the shape of the clubhead is cool. One word to the wise: When you're ready to play with adjusting the shaft, do it on the range with a pro shop where a pro might help you figure out what is best for your swing.